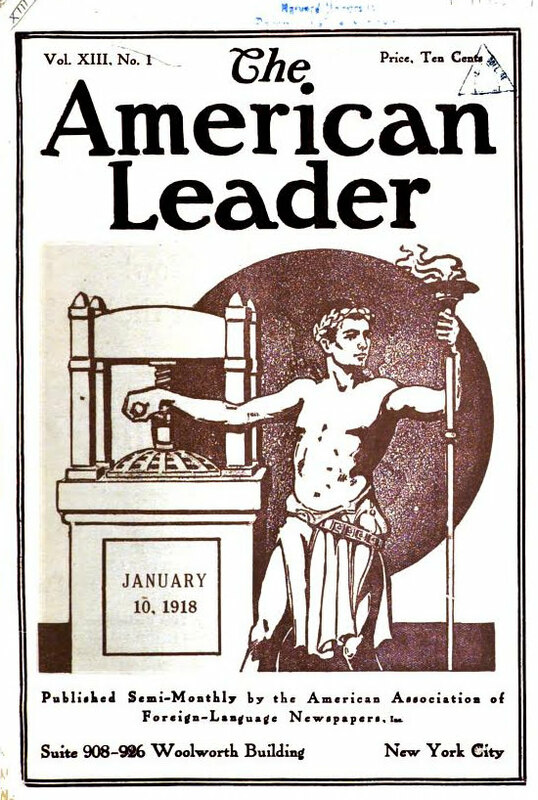 The American Leader, in 1912. 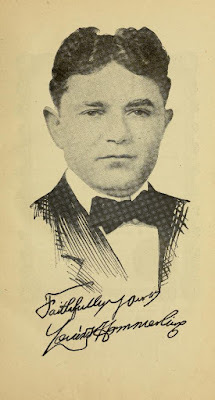 In 1908, when Louis N. Hammerling founded the American Association of Foreign Language Newspapers, he had long since persuaded his colleagues that he was Hawaiian – born in Honolulu in 1874; immigrated to the U.S. in 1886. Unfortunately, as Louis once scribbled in a passport application, he could not recall the name of the steamer and the point of departure. That is because he had, in fact, emigrated from Poland in 1879 at the age of nine. Much later, when the truth emerged, Louis explained that he thought every immigrant was allowed to choose his own birthplace upon arriving in America. 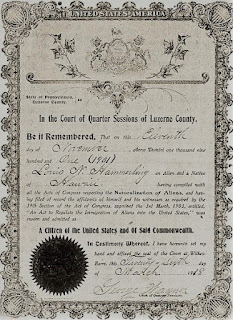 He also admitted that he perjured himself while obtaining his naturalization papers in 1901. Louis led the quintessential checkered life. Scholars and contemporary observers have described him as charismatic, problematic, and wily; a master of fraud and intrigue, a huckster, a self-promoter, and an "allrightnik." Allrightnik is a Yiddish word for a striver who attains success yet remains vulgar and deceitful. Around 1890, Louis moved to Wilkes-Barre, PA, to work as a coal miner and mule driver. He also became editor of a local Polish language newspaper. Soon after, he began editing the United Mine Workers Journal. Through that connection, he met Mark Hanna, an Ohio businessman and influential politician who owned mines and was largely responsible for getting the pliable President McKinley elected. Subsequently, Hanna introduced Louis to members of the Republican National Committee. They hired him to manage the party’s appeals for immigrants’ votes between 1904 and 1916. 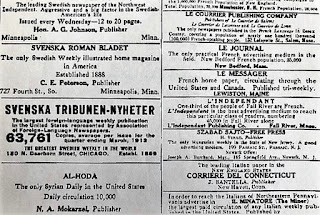 By the turn of the twentieth century, the U.S. was home to at least 400 foreign language newspapers published in at least two dozen languages. 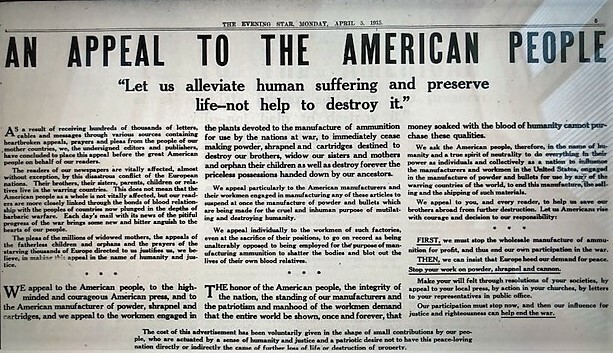 In 1908 Louis formed the American Association of Foreign Language Newspapers (AAFLN), requiring that each member-newspaper purchase a few shares in the association. Next, he made a match. American corporations, government, and political parties had spent years trying to reach the burgeoning immigrant population. Big business had stuff to sell: thousands of retail products. Politicians wanted to pitch the pros and cons of social movements such as Prohibition. Electioneers and marketers were hired to corral the votes of immigrants. But language was a formidable barrier. Organizing the foreign language press enabled Louis Hammerling to act as an advertising broker. He established rates, bullied reluctant publishers, and pocketed money from unwitting parties on both sides of the fence. He believed that advertising would help “Americanize” immigrants by tethering them to the consumer culture. Albania … Arabia … Armenia … Assyria … Austria … Belgium … Bohemia … Bulgaria … China … Croatia … Denmark … Estonia … Finland … France … Germany … Greece … Hungary … Iceland … Italy … Japan … Lithuania … Norway … Poland … Portugal … Rumania … Russia … Ruthenia … Serbia … Slovakia … Slovenia … Spain … Sweden … Syria … Turkey … and Ukraine, not to mention papers read by the Welsh, the Swiss, the Lettish, and Jews. 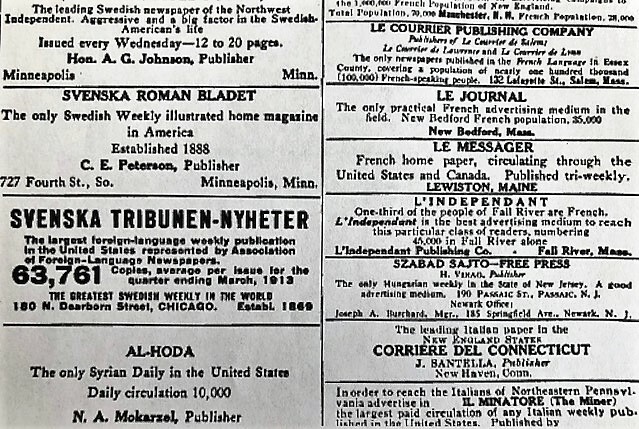 Altogether they totaled 724 publications, 150 dailies and 500 weeklies plus magazines, published largely in Midwestern and northeastern cities. 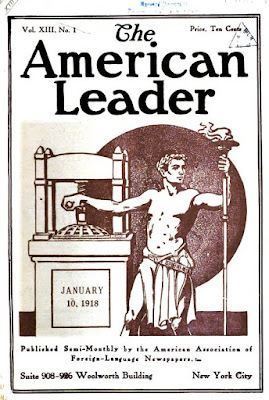 In 1912, Louis started his own monthly newspaper, The American Leader. In its pages, academics, businessmen, and foreign language journalists editorialized about current events. 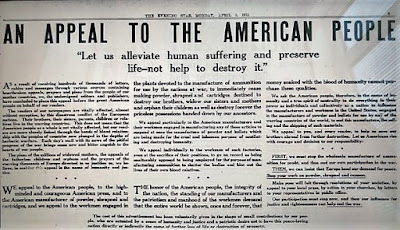 But The American Leader (and other papers in the AAFLN) became best-known for a 1915 advertisement, written by Louis, entitled “An Appeal to the American People.” It called for the U.S. to stop manufacturing weapons and ammunitions for the allies, and was widely regarded as pro-German propaganda. During the early 1920s, Congress investigated Louis and others who were suspected of violating the 1918 Sedition Act. Louis stopped publishing The American Leader and handed off the presidency of the association. Ultimately, he was expelled from the U. S., but not because of treason. Rather, the government figured out that he had used false papers to become naturalized. He journeyed back to Poland in 1924; then returned to the U.S. in 1930 and was re-naturalized legally. Louis married twice and fathered three sons. Born Jewish, he converted to Catholicism but was not a religious man. In 1935, he died after falling from the nineteenth floor of a Brooklyn apartment building. At a time when newspapers still announced suicides and even the gory details, no cause of death was given. *Louis Hammerling led a complicated, duplicitous life. See The Most Dangerous German Agent in America, The Many Lives of Louis N. Hammerling by M. B. B. Biskupski (2015). This is one your classic insights into a square our collective past lost to the collective memory. How to reach the multilingual immigrant market? Now it's cable TV, mostly. It's was a good source of work for the reporters and journalists who immigrated.